But there are many others extensions available to you in AdWords. On April 11, 2016, Google Analytics posted “release notes” with a laundry list of features that have been added. If you crave the maximum AdWords data that you can get your hands on, you’re going to love this new feature built into Google Analytics. While the release has been over a year ago the report has slowly filtered into accounts across the globe. Before having this nifty report you might have gone the custom reporting route in order to better track site links performance in your AdWords ads. 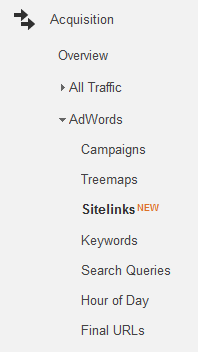 But Google Analytics has made a chance to now offer Sitelinks reporting as a standard offering in their reporting. Google had mentioned in the past that AdWords site links boost clickthrough rate on average by 10-20%, and for branded terms, 20-50%. Knowing that, plus the data we had access to the in AdWords platform on-site links was enough to keep us happy. Yes, you can get a fair amount of data on site links by accessing ad extension stats in the AdWords dashboard. Things like clicks, clickthrough rate, costs, average position, etc. This shows you how the individual site links are performing, but we lacked the additional insight on what happened after a click on the site link. To get access to this report you will have to sync your Google Analytics account with the Google Adwords account affiliated with your site. Driving site link data directly into GA not only eliminates old manual tracking practices but makes it easier to build reporting dashboards, do comparisons and run tests. Having all the data in one place will make it easier to provide reports, do A/B testing and ultimately improve the value of site links for paid marketers. Google continues to use Analytics as the place to consolidate its other platforms data making it a more valuable tool for marketers from a range of disciplines. So what do you think of this new site links report? Let us know in the comments section below.